I couldn't resist getting close to the lovely Tim Wonnacott, he's a real gentleman. 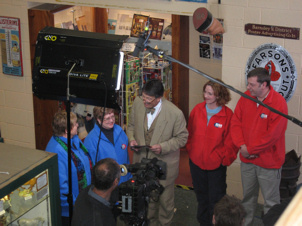 Once again, BBC's Bargain Hunt will be filming in the Antiques Centre on Monday 15th October 2007! On the 8th of April 2006 we were host to "Bargain Hunt" as seen on the BBC. Those shows were aired in October and November 2006. We were then delighted when we were asked if the BBC could return to film another two shows. 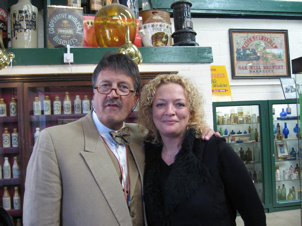 Tim Wonnacott and the team visited us again on the weekend of 13th and 14th January 2007. We have initially been informed that these shows will be aired sometime in June, we will confirm which date nearer the time, on this website and via flyers in the Antique Centre. The BBC point out that transmission times & dates can change at the last minute. Tim Wonnacott and the experts for the day, Kate Blliss and Dave Harper. 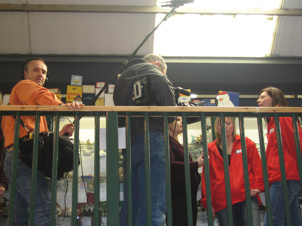 You can now view the photos of the second filming of Bargain Hunt. Please visit the next page.